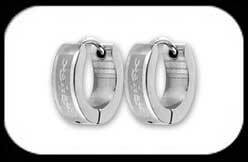 Wide Hoop Earrings (SSE123) in surgical steel 316L, hinged. Approx sizes 14mm external diameter, 3.8mm wide. Hoop earrings are sold as a pair (2).